Retailer loyalty programs have disappointed, with consumer engagement declining despite an increasing number of programs, because messaging is typically generic and uninformed by context. This is changing as retailers take advantage of consumer adoption of mobile apps to gather user data for in-store as well as online shopping. WMT’s Savings Catcher program is an example, but covers only ~3% of store receipts because of the friction involved in asking consumers to upload receipts. The integration of loyalty (to establish consumer identity) with payments (to associate transactions with that identity) holds the promise of making this upload automatic at WMT and other retailers creating opportunity for vendors, such as PAY, who can support retailers in capturing transaction data and vendors, such as PayPal, who can support retailers in analyzing these transaction data. However, mobile payments (whether enabled by NFC or QR-codes) provide little contextual data on location creating a business case for beacons, lower-power proximity sensors capable of sending short messages to compatible smartphones (meaning most devices after Apple set out “iBeacon” specifications for both iOS7 and Android devices). Beyond location-based messaging (to support, for example, product-discovery and personalized marketing while a shopper is in-store), beacons have the ability to resolve app clutter (by waking a retailer app and popping it to the home-screen when a shopper enters the store), and support ‘silent’ apps that harvest user data and send it to a server for value-added analysis”. In other words, beacon apps can be to the offline world what cookies are to the online world – silent software that tracks the visits and activities of a shopper. This, in turn, will allow offline retailers to curate the experience of a shopper based on past and peer-activity just as online retailers do today. A key promise of beacons is to allow retailer apps to determine not only what their customers buy but how they buy: the literal “path to purchase” through a store as a beacon app saves the breadcrumb-trail of shopper movements through a store thereby shedding light on the shopper’s decision-making process and possible improvements in store layout. Beacon technology has the ability to democratize the visitation data that has been the sole purview of larger, online brands – how many people have visited within the last week (or over a specific date range), what was their path to purchase (the order in which the webpages were viewed), as well as some sense of the demographic profile of visitors. Beacon technology, eventually, has the ability to deliver this data to the physical store, down to the smallest mom and pop shop owner, in keeping with our belief that the physical and the online converge. As the singular focus on data-security which followed the Target breach of November 2013 broadens to include other IT initiatives, accessing and protecting beacon-data will become increasingly important to retailers so that beacon deployment, close to 30,000 at end-2014, is expected to increase to 3.5mm units by end-2016 with Macy’s, Kenneth Cole, Lord & Taylor, and Timberland all running pilots and penetration of the top-100 retailers expected to exceed 80% within 3 years. The challenge for retailers, however, is that deploying the hardware is not sufficient: retailers need an infrastructure to monitor and manage their beacon “fleet”, the ability to beacon-enable apps on shopper phones, and support for geo-fencing, push-messaging, and analytics. PAY: We believe the terminal upgrade which is currently driving Verifone’s results has a longer runway than consensus and will increasingly be supplemented with the sale of add-on software services to improve operational performance and retailer marketing effectiveness. PayPal: While PayPal is best known for its buy button, it performs a more hidden role which is absolutely central to the digital-enablement of retailer models: it provides a so-called “gateway” that acts as an interface between front-end point-of-sale software (whether in-browser, in-app, or in-store) and the back-end plumbing that underlies the US payments system. These gateways are sometimes referred to as an operating system for payments and they provide a natural accumulation point for transaction data regardless of whether the transaction originates online, from an app, or at physical point-of-sale. As the only scale-provider of gateway services across all three channels, we see PayPal as uniquely positioned to support retailers in the digitization of their business models and expect the firm to meet or beat medium-term guidance for 25% revenue growth. Beacon deployment is in its infancy across retail, restaurants and lodging – primarily pilot programs in a handful of stores/restaurants/properties. Macy’s (M) is the most advanced in terms of its deployment, with its entire store base involved in the program. That said, the current use of beacons primarily as the means to deliver coupons is well short of what we see as the promise. However, the future is now, and the expansion of beacon technology is likely to be aggressive in 2016 and 2017, with increased functionality. Beacons, small low-power proximity sensors that can push short-messages using Bluetooth Low Energy (BLE) wireless communication to compatible smartphones based on location, are beginning to shift from pilot tests by retailers to larger-scale deployment. The promise of beacons is to allow retailer-sponsored apps to determine not only what their customers buy but how they buy: the literal “path to purchase” through a store as a BLE-enabled app saves the breadcrumb-trail of movements of a shopper through the beacon-zones of a store thereby shedding light on the shopper’s decision-making process and possible improvements in store layout. Beacon deployment, close to 30,000 at end-2014, is expected to increase to 3.5mm units by end-2016 with Macy’s, Kenneth Cole, Lord & Taylor, and Timberland all running pilots and penetration of the top-100 retailers expected to exceed 80% within 3 years. The core notion is that many shoppers already have their phones in hand when they enter and navigate a store, and already use the phone for a variety of shopping-related activities (see Exhibit 1), creating the opportunity for beacon technology to encourage nearby users to enter a store (proximity use-case), to offer a welcome message as a shopper enters the store and ready a pre-approved payment method for any purchase (check-in use-case), to market relevant sale items and offer coupons based on shopper profile and previous history (marketing use-case), to provide personalized location-based assistance and product information as a shopper moves through the store and approaches particular items (navigation and product-discovery use-cases), and finally to enable cashier-less checkout assuming a pre-approved payment method (checkout and payment use-cases). Beacon provider SWIRL reports engagement rates (as measured by consumers opening a pushed messages triggered in-store by a beacon interaction) of 60-70% compared to a 12% engagement rate for generic push messaging. Furthermore, where the push message specifically targets a transaction, SWIRL reports a redemption rate of over 30%. Beyond store deployment, beacon solutions require phones to support BLE (as opposed to only standard Bluetooth), and consumers to download BLE-powered apps and opt-in to receive push-notifications. Beacons themselves are inexpensive with Qualcomm’s Gimbal Beacons, for example, available at $5 or less so that maintenance costs, particularly in terms of software updates, are likely to be a more important issue for large chains with thousands of beacons across hundreds of stores and a consequent need to manage them at scale. A number of vendors, including Cisco Meraki, are creating a device-management infrastructure including, for example, facilitating beacon fleet management through Wi-Fi backhaul that can support cloud-based dashboards and, with the Wi-Fi hub also acting as a beacon in itself, provide over-the-air (OTA) monitoring of beacons for battery life and operational performance and managing of beacons through updating firmware. A beacon represents an unsophisticated use of BLE technology and, without an ecosystem, is a radio transmitter with no listener. The trigger for retailer interest, therefore, was Apple’s announcement in July 2013 of its iBeacon specification for iOS7 and Android devices. This allows smartphones to scan for beacon messages and then filter and direct selected messages to specific apps or to initiate actions within the iOS native-app Passbook (now rebranded in this month’s WWDC as Wallet) and Android’s PassWallet equivalent. As Verifone has commented “all of this takes place with no user intervention and minimal impact on battery life; it opens up the opportunity for “silent” apps that harvest user data and send it to a server for value-added analysis”. In other words, beacon apps can be to the offline world what cookies are to the online world in the sense of being silent software that tracks the visits and activities of shoppers. Finally, a beacon system requires consumers to download an app that can beacon-enable their devices. An example of the possible improvement in user experience is provided by PayPal. Today, consumers can check-in to participating retailers with PayPal but this is done manually by the consumer opening the PayPal app. The promise of beacons is that they can automate the process so that once the phone receives a beacon signal to identify a store, the PayPal app automatically checks-in assuming the relevant permissions are in place and begins the process of complementing the shopper’s store visit with digital engagement. PayPal enables the process since, after the beacon wakes up the PayPal app, it communicates with PayPal servers which are, in turn, integrated to in-store Wi-Fi and point-of-sale (for certain terminal manufacturers including NCR and Micros, for example). As is the case with many emergent technologies, the possible uses may outnumber the practical applications in the long-run, but beacons potentially represent a key element in aiding retailers in building the “immersive brand experience” that we believe represents the future of retailing. For starters, beacons can extend the brand beyond the limits of the store, whether it is a window display that calls out to a passing shopper in a mall, or a beacon located at a bus or subway stop. Beacons could conceivably direct shoppers to a store without them being anywhere near the store. Stepping back from the shopper for a moment, beacons can benefit retailers in a number of different ways. We have mentioned floor plan optimization with respect to identifying traffic patterns. In larger stores with multiple vendors, retailers will be able to track vendor movements, guaranteeing that displays are stocked and neat. Maintenance efforts can be made more efficient once high traffic areas are identified and targeted. It sounds corny, but to say the possibilities are limited only by imagination isn’t too far off the mark. The primary challenge for retailers (and beacons) is that shoppers have to opt in by downloading an app (either the store’s own app or a third party, such as the mall operator or broader aggregator). If it is the company’s own app, it will be in competition with a number of similarly situated companies that are vying for the same “share of screen/phone”. Generally speaking, we can see a consumer downloading a couple of apps, but less likely an app for every store that they visit. As is the case with getting a consumer into the store, the retailer’s app must offer a compelling value proposition – a contextually relevant experience with obvious benefits to the consumer. We believe that Macy’s (M) has the largest current installed and planned deployment of beacons in retail, with 4,000 beacons planned for 800 stores. Macy’s has partnered with Shopkick to get the beacons in all the company’s stores nationwide. 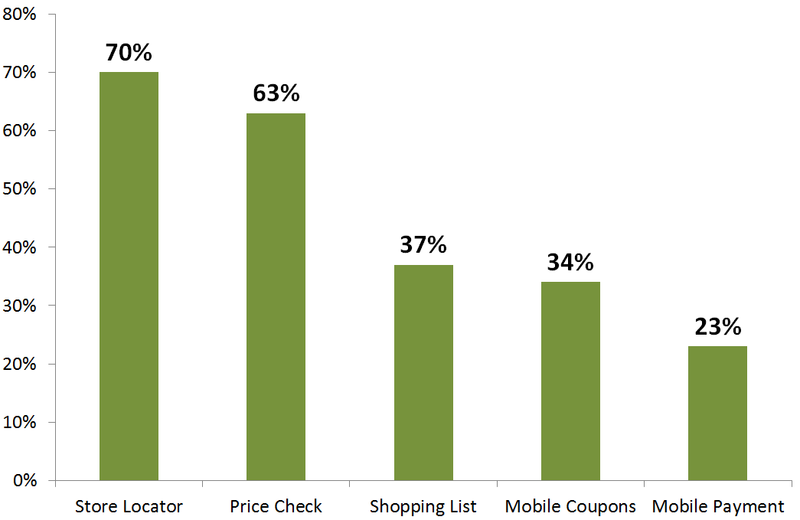 As it currently stands, beacons are primarily a way to deliver coupons. In fact, according to Shopkick, half of beacon delivered content is some form of coupon. This is obviously a long way from their optimal use of driving loyalty and collecting data on in-store activity, but we expect that the increased functionality and utility should follow in relatively quick fashion. Companies such as Kohl’s (KSS), GameStop (GME), Ulta Salon (ULTA) are all in various stages of exploring beacon technology. In the QSR world, McDonald’s (MCD) has tested beacon technology both in the U.S. (Georgia) and abroad (Turkey), using the technology to push promotions to customers. In that capacity, beacons provide little more than the ability to deliver coupons, albeit in a very relevant fashion in terms of timing. This likely represents only the tip of the iceberg in terms of the opportunity represented by beacon technology. In prior RetailTech pieces, we have discussed the concept of order ahead – beacons could potentially marry the concept of order ahead with timely food preparation. Using a longer-range beacon, the kitchen can be notified when a customer is approaching, insuring food quality. Reversing the concept a bit, as customers in your restaurant engage with beacons, that information can in turn be used inform potential customers of likely wait times, seat availability, etc., helping customers self-manage the flow of bodies through the restaurant and improving the dining experience by limiting wait times. Finally, while knowing how customers flow through the building is likely of less importance to a restaurant owner than to the owner of a larger retail space, quantifying peak hours (defined by number of customers) with precision enables you to better allocate staff. Originally a pilot program at 26 McDonald’s restaurants in Georgia, the company is rolling it out to a broader test – 260 sites by the end of 2015. While traditional bricks and mortar retailing has been the primary focus of this particular piece of research, the opportunities for beacon technology extend far beyond that. For example, InterContinental Hotel Groups (IHG) is piloting beacon technology in its hotels, sending guests offers and perks based on their location within the facility. While the obvious uses would be to drive sales at the spa and golf course, for example, or restaurants on the property, ultimately it could be expanded to include offers from local businesses near the hotel. Starwood Hotels and Resorts (HOT) and Marriot International (MAR) have similar pilot programs in a handful of hotels.